If you’re a fan of the iChat application in previous OS X releases and wonder where it went in Mavericks, Messages is the answer. 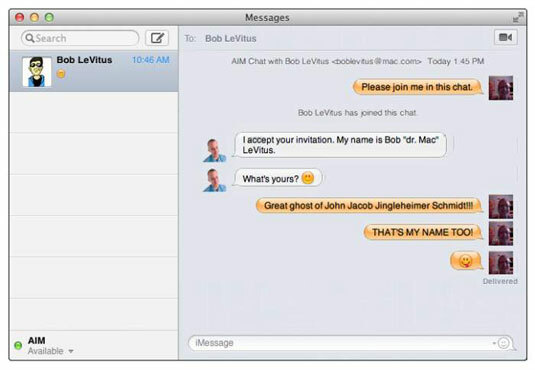 The program you knew and loved as iChat is now called Messages. Same great iChat tastiness and now with support for iMessages! Instant messaging and chat rooms enable interactive communication among users all over the world. If you’re into instant messaging, Messages gives you immediate access to all the other users of AIM, Jabber, Google Talk, and iCloud. All you need are their screen names, and you’re set to go. You can even join any AOL chat room just by choosing File→Go to Chat Room. To get started, launch Messages from either your Applications folder, Launchpad, or Dock. iMessage is Apple’s inter-device messaging protocol. That means you can send unlimited iMessages to anyone with an iPhone, iPad, or iPod touch running iOS 5 (or later) or a Mac running Mountain Lion or Mavericks (OS X 10.8 or 10.9). Think of it as MMS messaging, similar to what you find on smartphones, but you can send and receive messages from your Mac. Better still, an iMessage can include photos, videos, locations, and contacts in addition, of course, to text. And if you have more than one iOS device, iMessage keeps all your conversations going across all of them. You can also get delivery receipts letting you know your messages went through. You’ll know it’s been read, too, if your friend has enabled read receipts. To start a text chat, open Messages, select a buddy in your buddy list, and choose Buddies→Invite to Chat. If you don’t see your Buddies List, choose Window→Buddies or press Command+1. Each participant’s picture (or icon) appears next to anything she says, which is displayed in a cartoonlike thought bubble. If you find the thought bubbles a little too childish, you can turn them off by choosing View→Messages and an option other than Show as Balloons. To start a group text chat, hold down the Command key, click each person in your buddy list that you want to include, and then click the A button at the bottom of the buddy list. In a group text chat, everyone sees every message from every participant. To attach a picture to a person in your Contacts, copy a picture of the person to the Clipboard in your favorite graphics application (Preview, for example). Now open Contacts, and display the card for the person you want to add a picture to. Click the empty picture box at the top of the card, and paste the picture on the Clipboard. You should now see that picture on the Contacts card and also when you chat in Messages with the person. Neat! If you’ve already attached a picture to a contact in Contacts, that picture will appear automatically when you chat. To transfer a file or files, just drag the icon(s) to the message box (where you type your messages), and then press Return or Enter. The file zips across the ether. This is a very convenient way to share photos or documents without resorting to file sharing or e-mail. When you drag an image file onto the Messages window’s message box, you see an oversize semitransparent preview, so you’re sure you’re sending them the right image and not something totally embarrassing. Way to go, OS X Mavericks. You could also choose Buddies→Send File or press Command+Option+F and then select the file(s) from a standard Open File sheet, but the drag-and-drop method is faster and easier. To send an e-mail from Messages, just select a buddy in Messages’ buddy list and choose Buddies→Send Email (or press Command+Option+E). Mail launches (if it’s not already open) and addresses a new message to the selected buddy, ready for you to begin typing.